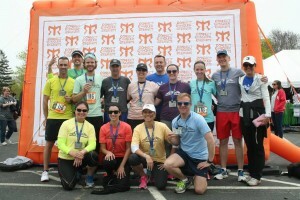 Building on the success of the Inaugural “Run for Nazareth Farm” fundraiser last spring, our Catholic community is organizing a second “Team Nazareth Farm” to participate in the 200-mile overnight Ragnar Relay event on September 16-17th (Friday-Saturday) and help raise funds to sustain Nazareth Farm. This challenging but fun overnight relay event will begin in Cumberland, Maryland (not far from Nazareth Farm!) and end in our nation’s capital, Washington, DC. We are excited to report that our team roster is nearly complete, but we are still looking for a couple of enthusiastic runners (all ability levels welcome) for this year’s team. Accommodations will be provided for all participants. This overnight relay is truly a rewarding event’s for all participants and a fun way to help raise needed funds for our community. Last year’s inaugural run brought together many members of extended Nazareth Farm family and generated more than $15,000 in support for the Farm’s mission in Appalachia. In addition to runners, Nazareth Farm is in need of a few volunteers to help us support the relay team on its journey from Cumberland, Maryland to Washington, DC. If you live in Maryland or within the greater Washington, D.C., area, we could use a few folks to help support the team at the relay handoff points or upon our arrival in Washington Saturday afternoon. Do think you might be interested in lacing up for this year’s Run for Nazareth Farm? Or can lend a hand as a volunteer? If so, please email this year’s team captain, Adam Siple, at adamsiple@gmail.com soon.